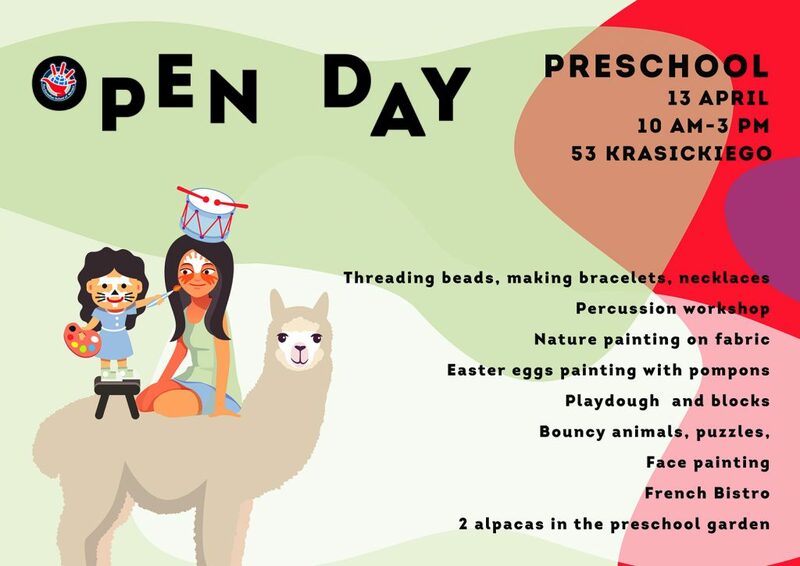 We would like to cordially invite you to our Open Day to take place on Saturday, April 13th from 10 am till 3 pm at 53 Krasickiego Street. Many great activities will be waiting for our young visitors and their Parents will get a chance to have all their questions answered by our professional international staff 🙂 Hopefully the weather will be on our side and you also get an opportunity to enjoy our beautiful Preschool garden and get a tour of our great facilities. All the activities will be ongoing, except for the percussion workshop to take place at 1 pm, and alpacas will be waiting for children in the garden between 12-2 pm.